Oh, Giada, yet another recipe you've given me to love. 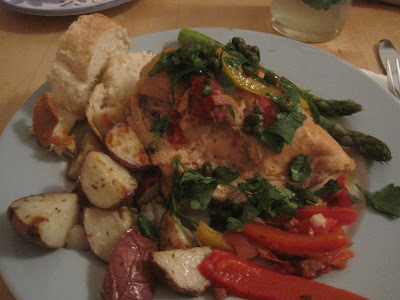 I DVR'd her "Make Ahead" show months ago, planning to make her Roman-style chicken one of these days. It's one of those dishes that is delicious the day you make it, but exponentially more appetizing the next day. I figured I could make it the day ahead for Valentine's Day dinner with ABF, and then just warm it up when he came over to my apartment. I'm all about living smarter, not harder! This colorful, tasty dish is well-worth the effort. 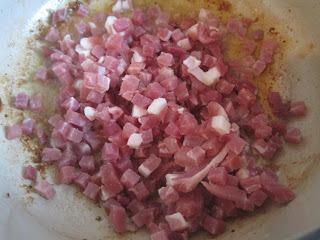 I bought pre-cubed prosciutto, and used 4 oz. instead of 3 (I read in comments that some people even doubled the prosciutto, but I think this amount was fine). 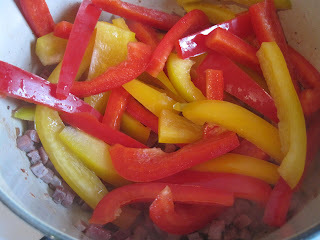 I used red and yellow peppers, which give a colorful burst to the dish's palette. I used fresh thyme but dried oregano (since I already had plenty of oregano on hand). I could only fit two chicken breasts in this pan, as they were HUGE (I mean, how big WAS this Fresh Direct chicken?? ), but I threw in some Trader Joe's boneless chicken thighs too, just managing to fit it all in there. Seriously. Huge. It's just beautiful and delicious, and highly-recommended. 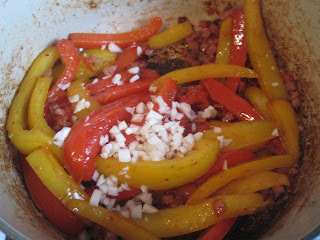 It takes maybe 30-40 minutes in the kitchen (with the help of my awesome Le Creuset Dutch Oven, again! ), and then you put it in the fridge to let the flavors meld. 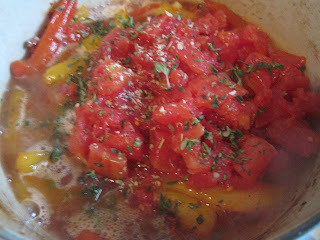 Warm it up slowly the next day, add fresh parsley and capers (which I now love!) at the last minute, and enjoy with roasted veggies--I did creamer potatoes and asparagus-- a side of crusty bread (day-old baguette I bought a month ago and stored in freezer--such a deal!) and roasted garlic. All the reviewers insisted this is even better the next day, which is when we ate it. There's still some leftover sauce, which I plan to pour over some pasta tonight for dinner! Mangia! ABF cleaned his plate, and so did I, so I count this as a super win! Even I was impressed I made this! It will definitely go into the Favorites rotation.